Princess Crystal's Royal Letters: Freelance Author: What is NaNoWriMo? Freelance Author: What is NaNoWriMo? The creators of the National Novel Writing Month (NaNoWriMo) wanted to find a way, for amateurs and professionals to find common ground. They desired to bring more aspiring authors, into the competitive market of novel writing. All of the participants are solely based on the amount of writing, which they produced in thirty days, instead of the quality. Basically, NaNoWriMo program was created about eight years ago, in order to showcase a writer’s dedication to their writing. However, since the contest creation, the program has expanded into a global revolution that is sweeping the world of writing. According to the Office of Letters and Light (2006), over 79,000 participants entered last year. Unfortunately, only about “13,000” (office of Letters and Light, 2006), were able to actually finish their novel. Each participant will try for their chance to become a new novelist, but only a few will be reaching their goal. Basically, anyone can join, as long as they are able to write a “175 page (50,000 words) novel” (The Office of Letters and light, 2006), during the month of November. Fortunately, the aspiring authors will not have to worry about the daunting task of perfecting each word or sentence. 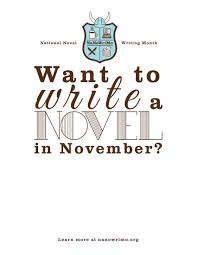 The NaNoWriMo program mainly focuses on an artist’s hard work and their commitment to writing daily. This contest encourages amateurs and professional authors to enter into the friendly competition. Don’t worry about the mistakes that will be made, since only they only judge the total word count. Every contestant is judged and rewarded for their daily perseverance. Also, the website offers a community to gain encouragement or to talk about the joys and sorrows of writing. For more information or to join the revolution that is sweeping the writing world, go to www.nanowrimo.org. This program allows a would-be author, to work hard and attempt to write a novel in thirty days from a blank page. Most of the aspiring authors come from several countries and different walks of life. Yet, each one has a sincere desire, to see their novel published and circulating in the local bookstores. Therefore, this year’s many contestants will be attempting to write their way into, “NaNoWriMo superstardom” (Office of Letters and Light, 2006). On November 1, 2015, a new round of contestants will be shooting for the finishing line. So, get ready to join them in a program, which will showcase the hard work of both amateurs and professionals alike. The contestants enjoy writing their heart out, while competing for the chance to be noticed by others.